So school started for reals this week, or at least as “for reals” as it ever really is at the husk of a university where I teach. Part of the problem is this rather large strike that has been going on for the past five days with no signs of abating. This means that getting to work has been a veritable hell, with only one train in every three running on the major commuter transit lines. Upon arriving at campus, the buildings may or may not be barricaded by stern-looking policemen or angry students. If I am so lucky as to get in to one of the classrooms, I’m usually greeted by one or two confused students, whom I chat with for a while before letting them leave. On Thursday, the one day that I actually had dozens upon dozens of students show up for my classes, it became clear that a major registration faux-pas had taken place and that nobody (myself included) was in the right place. Unfortunately, all of the administrators and secretaries are also on strike, so I wasn’t able to do much besides take attendance, play half-hearted rounds of the cannibal game (my favorite ice-breaker in which students gradually cannibalize one another on a desert island), and send everyone on their way. Basically, I was a glorified attendance-taker this week. I’m so glad I’ve had 9 years of higher education. Livin’ the dream, baby. I’m livin’ the dream. Add to that some other minor irritations and this was the kind of week that warranted one serious after-work happy hour. 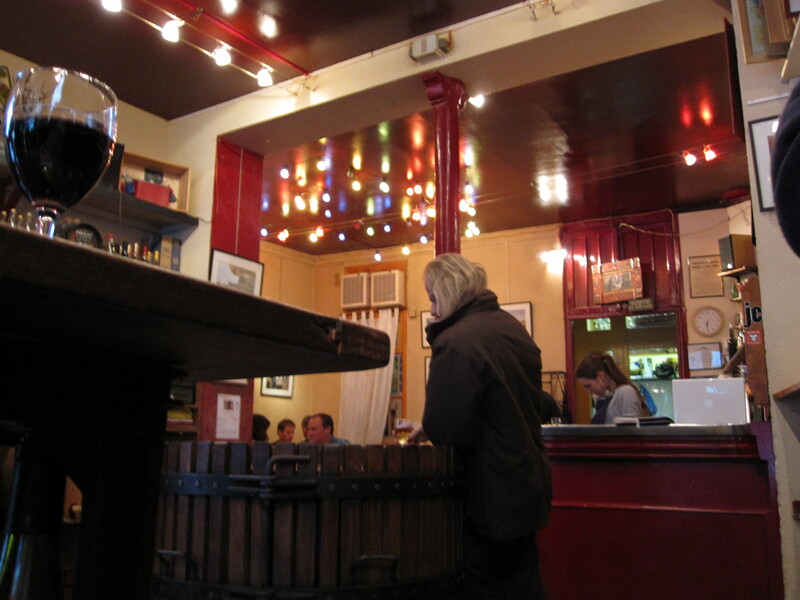 B and I fantasized all summer about organizing a kind of weekly get-together at one of our favorite wine bars, Le Baron Rouge (1 rue Théophile Roussell, 75012 Paris, Métro Ledru-Rollin). Think Thirsty Thursday all grown-up, complete with charcuterie plates and witty banter. We “discovered” this place (I’m like Christopher Columbus over here, discovering places that other bloggers have already written about ad nauseum) with BC and J last spring and quickly became devoted patrons. Le Baron Rouge is seriously awesome. They have an amazing selection of wines available by the (cheap!) glass, listed on large chalkboards. You can give yourself a rather comprehensive lesson in French wines just by gradually working your way down the chalkboard, as B has been methodically doing. Or, you can be a crusty old creature of habit like yours truly and just order a glass of the Pic Saint-Loup over and over again, because you like it, and because the true madness of modernity might just be forgetting what you actually like because you want to try everything. Or so us crusty old creatures of habit tell ourselves. 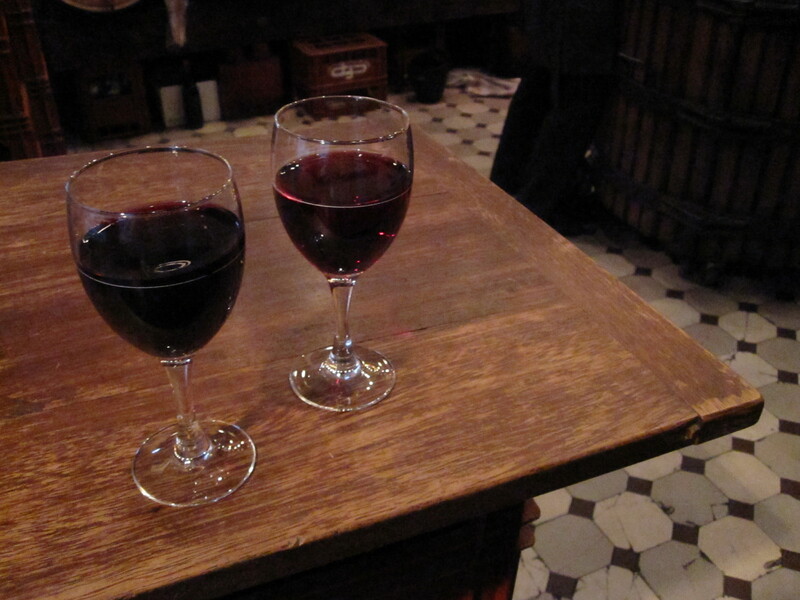 Either way, the wines are lovely and the bartenders are both knowledgeable and generous in their pours. At between two and four euros a glass (and you are getting some pretty knockout wines at the top end of that spectrum), you can afford to have a few glasses to blow off some steam. And, if you really like something, you can take home a bottle for less than you’d spend at your local wine merchant. Let’s say for a moment that you’re more serious drinker, or perhaps you like boozing at home, or feel a wide-eyed sense of wonder and value when you stroll the aisles of Costo. 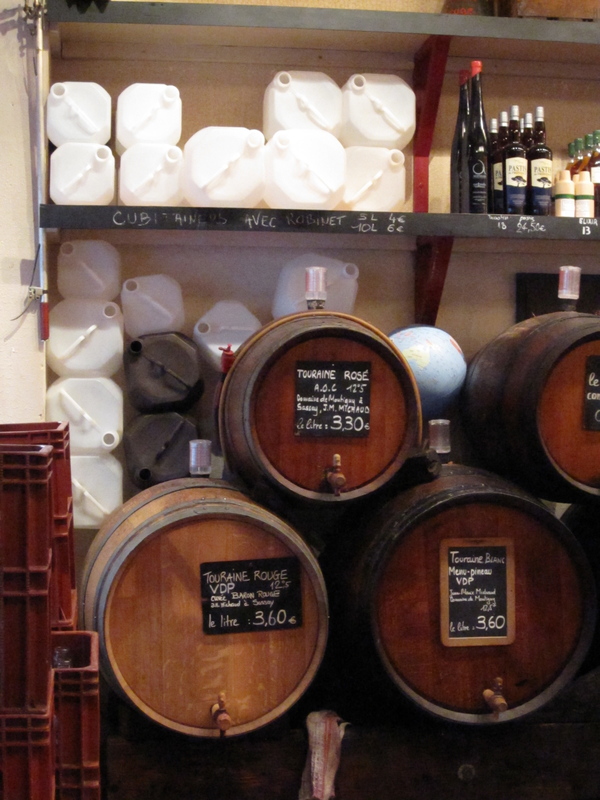 You might want to purchase a few liters of wine from one of the big barrels that line the walls of Le Baron Rouge. You pay a one-time fee for the plastic jugs, and then return whenever you want to refill for bargain-basement prices. I like it when my bulk drinking is green. Take that, Leonardo di Caprio. Have fun cruising around in your Prius, you know, the feel-good hybrid with the hideous environmental footprint? I only take public transportation and drink my wine out of reusable plastic jugs. Now who is feeling smug? More importantly, and lest you think I actually do anything beneficial for the environment besides begrudgingly sort my recyclables and ride Vélibs when drunk, let me tell you about the charcuterie plates. Oh man, Le Baron Rouge is like cured meat nirvana. Their large charcuterie plate is one of the best parts of my week, with slices of spicy dry salami, tangy garlic sausage, and two of the biggest mounds of foie gras paté and creamy rabbit rillettes you could ever hope for in your life. 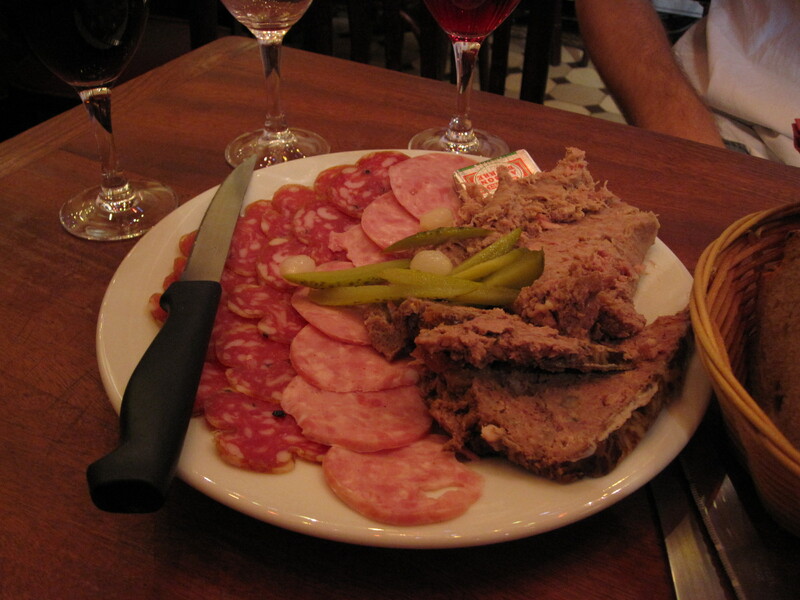 Most charcuterie plates leave a group of four wild-eyed and lusting after those final cornichons. But the charcuterie plate at Le Baron Rouge is totally satisfying and perfect for a table of four. Party of six? Add a mixte, which pairs an amazingly smoky Tomme de Corse with more of that great salami. You also then get the pleasure that comes from the opening of the cheese fridge at Le Baron Rouge, a most glorious stink that wafts through the entire joint and causes the Americans to glare suspiciously at their companions. Don’t worry newbies! It’s just cheese stink, magnificent, tremendous, old cheese stink. If they bottled it in perfume form, I’d be the first girl in line at Sephora. We gave our Thirsty Thursday plan a trial-spin a few weeks back with much success, with a half-dozen friends showing up to drink and chat around the enormous barrel in the center of the front room. This past Thursday was less successful, with B and I drinking alone until our table was gradually hijacked by the hoards of French workers that show up after 7 p.m. We left, disappointed that we weren’t living in our own version of Cheers and resolved to do better next week. 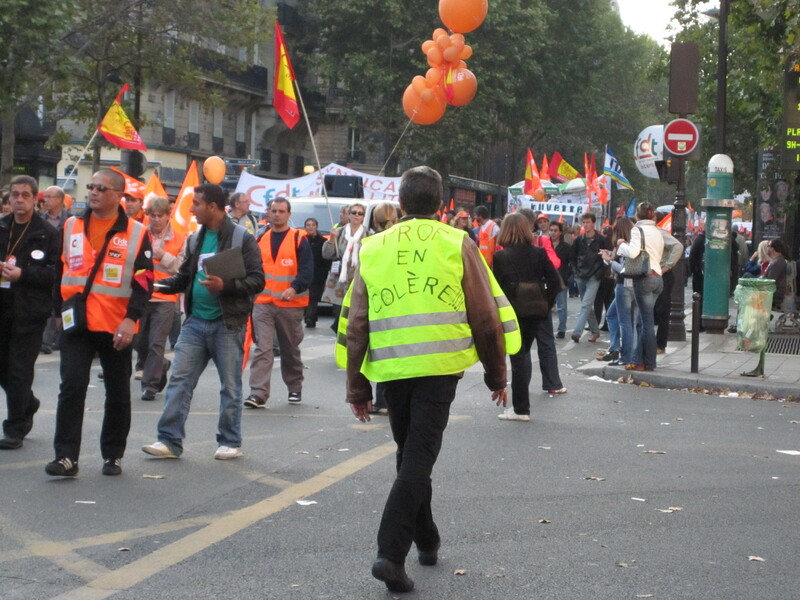 So, Paris denizens, Le Baron Rouge next Thursday? I get done taking attendance at 4 p.m., so we’ll aim for a prompt 6 p.m. arrival time. How about it guys? The charcuterie plate is on me.